Stopping The Northern Crusades: Who Halted the Teutonic Knights? Arguing about religion may appear to be a futile exercise, but it is a cause that mankind has fought and died for throughout history. Many factions of Christianity have tried to impose their beliefs on others. 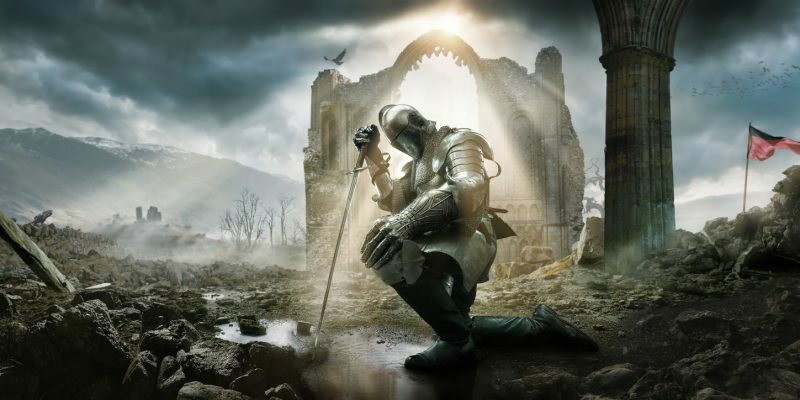 Perhaps no one has been more responsible for over-zealousness than the Teutonic Knights, one of the most imposing forces extant during the Crusades. The Knights owned many fortresses along the Baltic coast from which they launched attacks against those they wanted under their rule and under their belief system. Guns were not yet the weapon of the day, so the Knights were outfitted in armor and carried swords. When they decided to push for “ownership” of Poland from their seized land in Lithuania, rebellions and backlash soon broke out. The takeover was prompted by the wedding of Jadwiga of Poland to Jagiello of Lithuania, which led to a unification of the two countries. 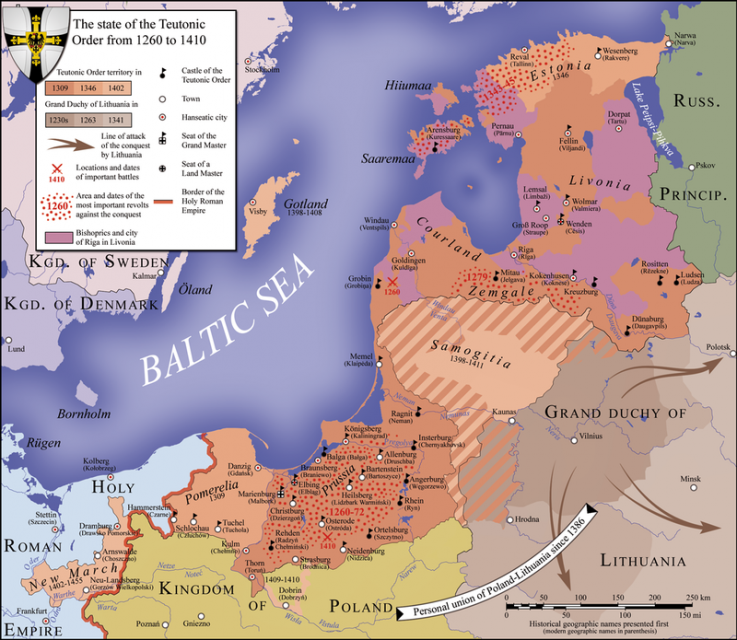 But talks between the two sides – Poland and Lithuania on one, the Teutonic Knights on the other – got nowhere, and bad feeling increased. Although Christianity was the prevailing faith in both countries, the Knights believed that many people did not practice it or, worse, were still pagans. So Poland and Lithuania decided to combine their armies long enough to fight the Teutonic Knights and take back territory they felt was rightfully theirs. 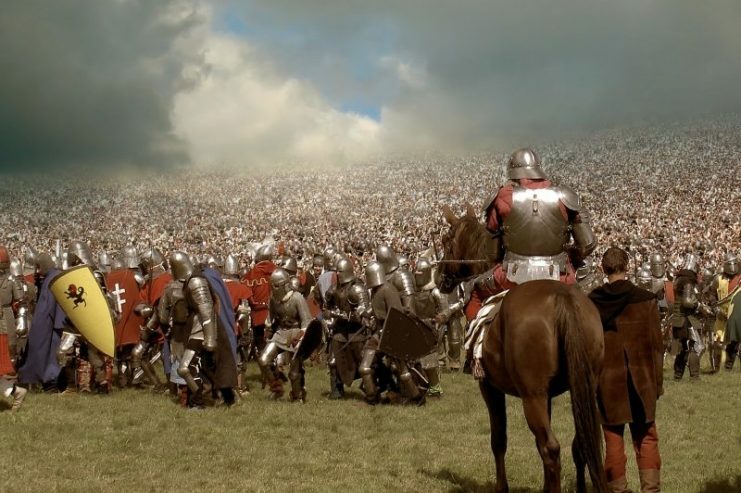 The Knights were considered the fiercest of all the armies in the Crusades and did not take this opposition lightly. The Grand Master, Ulrich von Jungingen, organized his army to take on the Polish and Lithuanian factions near the villages of Grunwald and Tannenberg. 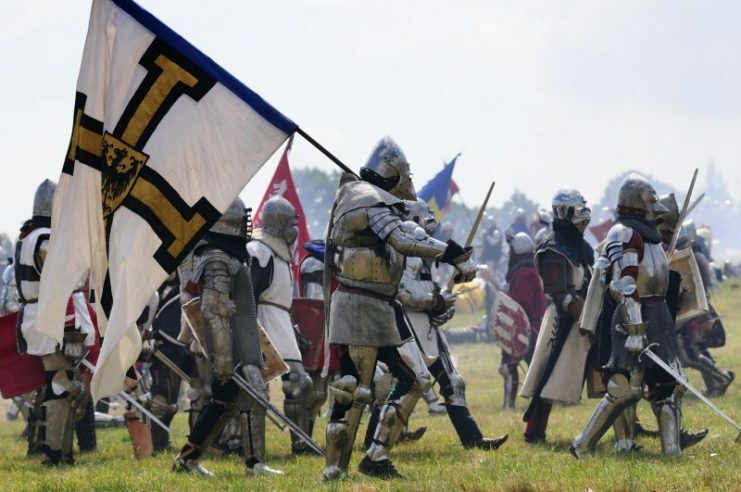 Historians can only estimate the number of soldiers fighting that day in mid-July, 1410, but some think the Knights had as many as 30,000 soldiers, while the Polish and Lithuanian army had approximately the same, or perhaps 40,000. The Grand Master, Jungingen, sent two swords to his opponent’s king with which he could fight. The gesture was seen as rude and patronizing, which is precisely what the Grand Master intended. 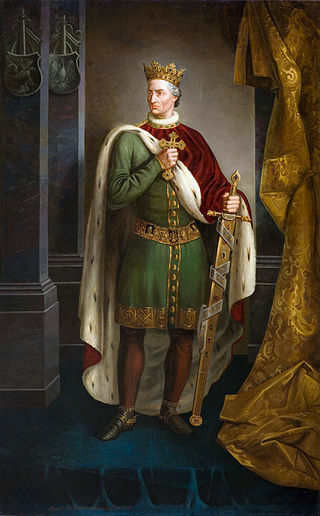 King Jagiełło of Poland took up the challenge and joined his comrades on the battlefield. As armies did in the days before guns and bombs, the two sides charged directly at one another. A symbol of coming defeat was the capture of a foe’s banner, which was carried right into the conflict. For centuries, many men died still clinging to their nation’s banner. The Grand Master saw an opportunity to charge directly at the king and seized it, but the Lithuanian Calvary intervened. A young soldier came between the king and a sword, and he would go on to rise as a very important figure in Polish government circles. The battle finally ended, but with no clear victor. Each side began to retreat – or at least seemed to. The Lithuanians had not pulled back as far as the Knights initially thought. The combined forces decided to rush back into battle, catching the Knights, who were by then disorganized and out of formation, almost by surprise. It took considerable effort, but the Lithuanians and Polish soldiers were able to repel the crusading knights and even captured many of their most important soldiers. The Knights tried to fight back, but even an improvised fort made of wagons could not ensure their survival. Many died, and many more were badly wounded. The Teutonic leader, Ulrich von Jungingen, was killed, as were many other of the Knights’ leaders. Painting of the central point of the battle, showing the stalled cavalry charge of Ulrich. Prince Vytautas is in the center wearing red while Ulrich is shown meeting his death on the left. The armies who had united were able to take back territory they felt was rightfully theirs. It was a major blow to the Crusades in general, and to the Teutonic Knights in particular who saw themselves as an almost invincible force. 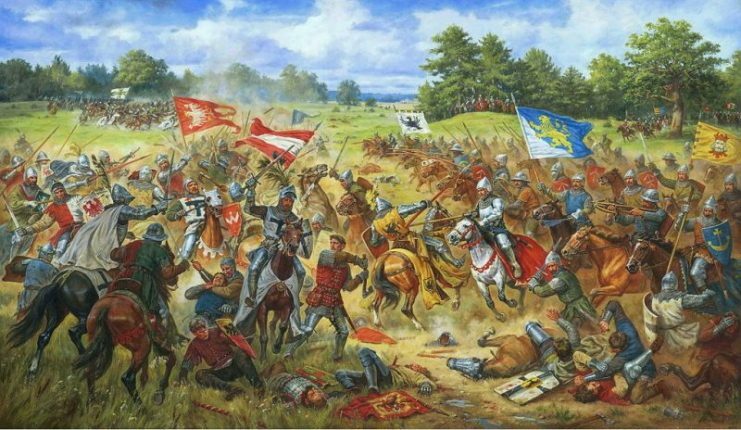 The Battle of Grunwald was a profound wound to Teutonic forces in Europe, and they were even compelled to pay for damage done during the conflict. 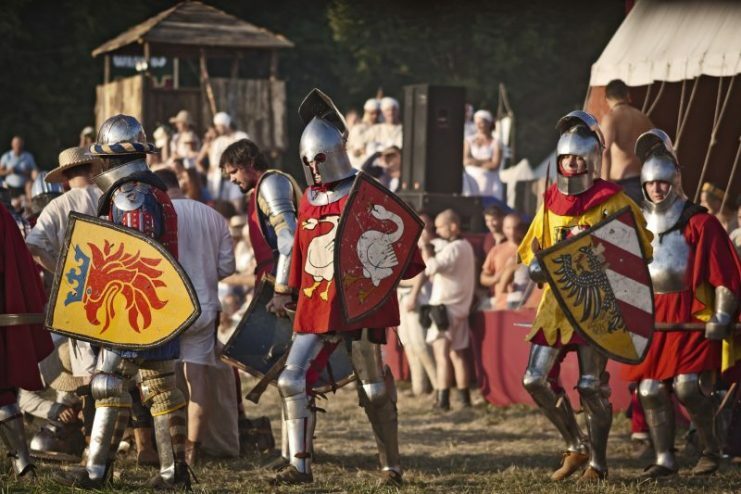 Reenactors dressed as Crusader Knights stand in battle array and prepare to enter a medieval battle which takes place at the annual historical reenactment of The Battle of Grunwald, Poland. The victory was a symbolic one for Poland and Lithuania as well. Even the two swords, given in insult, have come to represent strength, individuality, and belief in one’s cause. Medals bestowed on soldiers returning from World War II had the swords’ images emblazoned on them. But the Teutonic order was not completely wiped out. It evolved and adapted, and to this day it exists as a charity and religious order.